My daughter discovered a wonderful new place to eat in one of our favorite locations in Denver – on Pearl Street. It’s a small shopping district comprised of a couple of blocks in an area south of Denver proper that has unique restaurants and shops and it’s always fun to go there because you don’t see the same old, same old fare; that was so true of The Crushery. (Sad note; as of 2014 it’s now gone and has been replaced with another boring pizza joint). Despite being raised in the ‘burbs’ Lauren loves everything downtown. I’m not as crazy as she is about heading into the concrete jungle where parking is not a given so this has been a great compromise because we both love it and it’s got great charm…so unlike heading to the local mall. Park Meadows is beautiful but still pristine, find me a non chain store and I’ll give you my lottery winnings (not that I’ve won yet!). I think it was my very first venture out of the house a couple of months ago for something other than a doctor’s visit after breaking my leg and my best bud Barb came with us. It was casual and the garage door front facade was open on an especially nice day in April and we spent two hours there gabbing and trying a variety of their sandwiches and desserts. Nothing fancy here, just one big room and a counter for ordering your food. 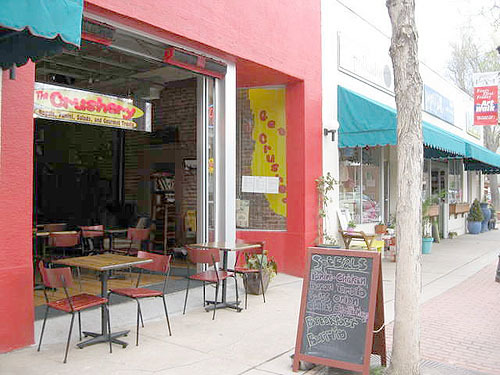 There are several tables, a fireplace and a charming patio in the back (with parking). Nice friendly wait staff round out what was a totally wonderful experience. Owner/Chef John Davidson provides a great place for food lovers by serving homemade breads, bagels, pannini, salads; they even make their own decadent desserts! I loved everything but was (still am) most crazy about their Shredded Pork, Bacon, Green Chiles, and Queso Fresco with Chipotle Aioli sandwich. My mouth is watering now just thinking about it! Since getting out at that time was so difficult, I decided to mimic my own version of this deliciousness at home. It’s a lighter version, mostly because I was not going to be cooking a pork shoulder anytime soon, so this is more of a standard grilled cheese, no meat anywhere in sight. I admit, first time I had ever had queso fresco on a grilled cheese sandwich so maybe standard is lacking for a description; this is anything but! Next up? Mimicking their preparation of ice cream? Nope, not anytime soon…they mix ingredients with a cream base and freeze on the spot. You’ll just have to come to Denver for our favorite mix of caramel, sea salt and graham cracker crumbs in vanilla. Yes, it’s that good! 1 package Queso Fresco cheese; ours was 12 oz. Combine sauce with mayonnaise to taste...some like it hot! I must admit, I did wish I had some bacon on hand...adding a couple of slices of crisp bacon to each sandwich would still make this an easy and delicious dish! More: Sadly this little place has gone out of business and has been replaced with a pizza joint. So glad I recreated this as a reminder...and why does every place I love die. ? I added a little garlic and cilantro to mine. YUM! Yum; that sounds good too; now I want it! I LOVE Pearl street! It’s such a great location – small town downtown feel.This sandwich sounds delicious and right up my alley! Gah! Jeda. must. have. this. sammy. You make me laugh…but it is simple and so different and, well, so good. If you come to Denver to pickup your book, I’ll take you to The Crushery. On me. Even buy you a nitrogen frozen ice cream! Looks like it’s time to thaw some of my Hatch green chilies! Sounds good. Although at the time used canned green chiles, I am looking forward to trying again with some fresh roasted ones from the farmer’s market…maybe with some bacon or pork even! OMG – that looks amazing Barb. I need to hunt down some queso fresco close to me.. This is one fantastic looking sandwich! That is one tasty looking grilled cheese sandwich! Kevin…thank you; I remember you from a while back when I used a recipe from your site for a salad I made. Small world indeed! This looks delicious! The queso with the chilies has to be a good combo. It is! Of course the chipotle aioli doesn’t hurt…that beat of heat is just right. I love being close to the city too; we live in such a beautiful suburb of Denver…but she craves the ‘city’ life much more than I do. I do enjoy that we have so many cultural advantages close by…with parking! Yes, please! I started drooling before I even read the title. Green chilis sealed the deal! We live in the suburbs of Denver so plenty to do here for me but you’re welcome to come and I’ll have her take you out! 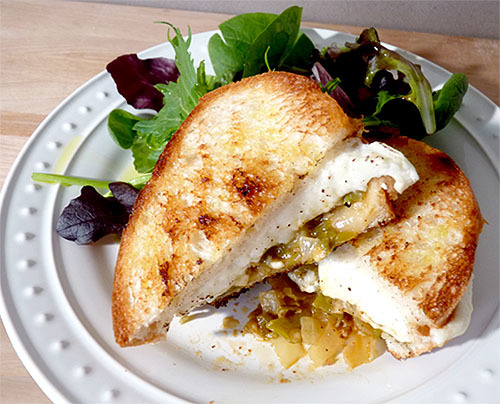 Grilled cheese is one of our favorites in the Smith Bites home – have never used a chipolte aioli but my mouth just salivates as I think about that combo!!! And adding pork? That’s a dreamy sammie!! !